I love Target and I love to wander their clearance racks! Yesterday, I found this girls' tank top for $1.12. Sunshine yellow tank top for a buck? Yes, please! I can do something with that (and so can you!). 2. Baste first ruffle piece in preparation for gathering. With the right sides together, gather and pin the ruffle to the band. Stitch. Press seam allowance toward band. Again with right sides together, match the side seams and stitch. Flip to right side. 3. Stitch short side seams together on second ruffle piece. Baste and gently gather one long edge of the ruffle. Ease and stitch to bottom of tank top, right sides together. 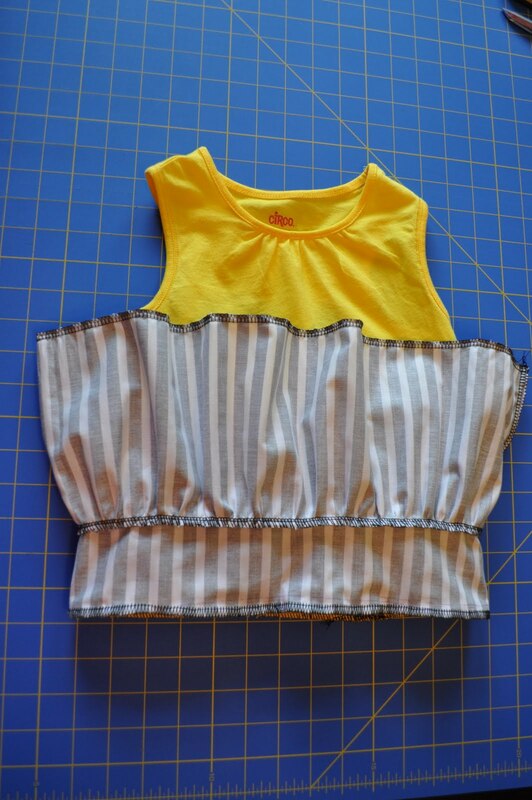 Pin the band with ruffle attached (right side) on top of the ruffle (wrong side) that you just stitched to the tank top. Stitch. Press seam allowance up. 4. Topstitch your ruffles to help them behave. 6. On to the collar... Place a piece of scratch paper on top of your tank top. 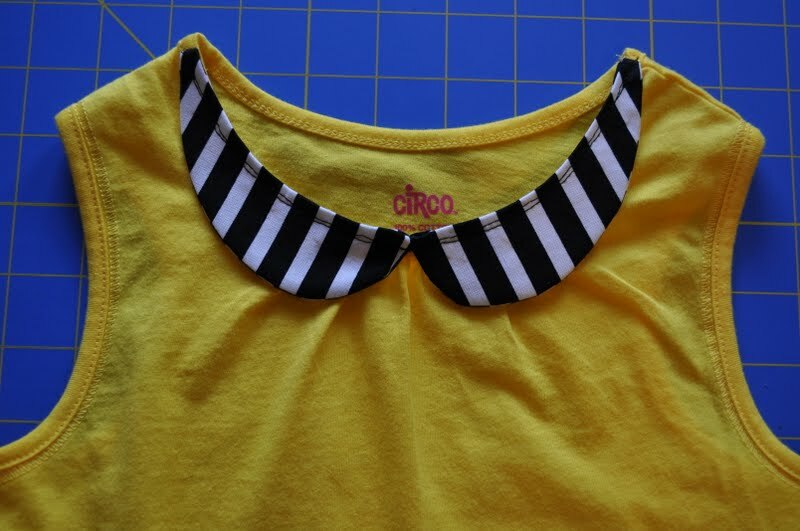 Sketch a Peter Pan collar. Cut the sketch out and eyeball it on your tank top. Love it? Use it. Hate it? Start again. No biggie. When you have a shape that you like, pin the sketched collar to fabric, trace the pattern adding about a 1/4-inch seam allowance, and cut four pieces. I used my handy dandy Mark-B-Gone pen to trace the piece. Cut two additional pieces out of fusible interfacing and adhere to two collar pieces. If you're at this point - congratulations! - you made it through the dumbest collar tutorial online. Everything else was easy though, no? 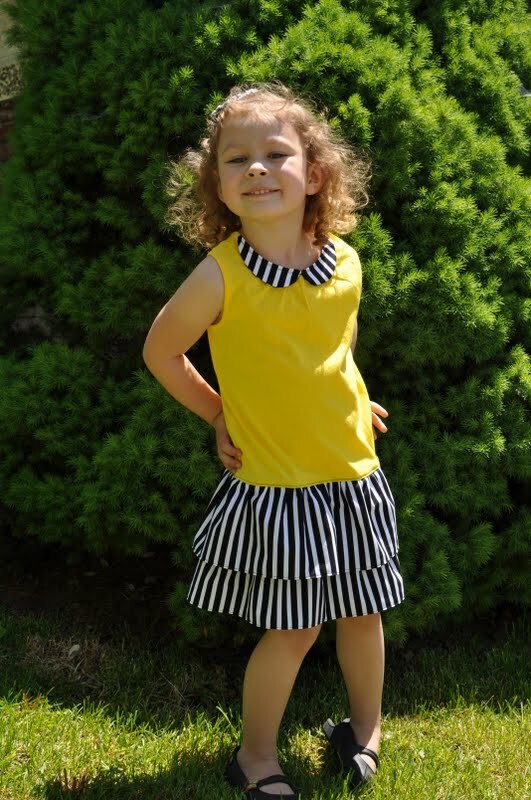 And now you have a darling little "Tank to Dress" (that YOU made) to show for it! I have to agree, Michelle!